Oh Manuela, the sausages were so, so scrummy and I would have thought you would have loved them with your Teutonic background. However, I loved them and they were to cheer up Katie anyway! Sheesh, everyone's a critic. 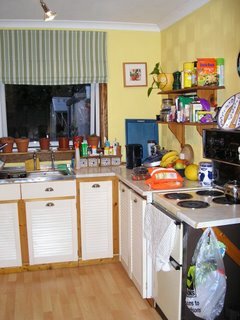 However, moving on from the sausages, here are some more pics from the soon-to-be-demolished kitchen. It looks awfy tidy and clean but as you can see from the things that sit on every available inch of surface, storage space is at a premium. 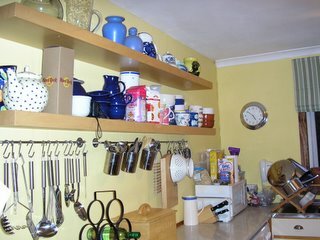 I am swithering towards a cream kitchen as that is what I have at the moment. Amy is completely correct in that during the winter, it is unmitigated gloom here. 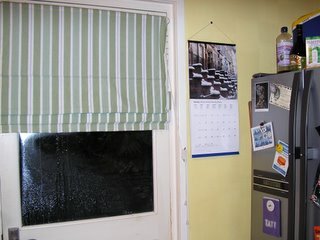 However, even in spring and summer, my kitchen faces north-east so gets full sun only at the end of the day. Light and bright is what is needed. I just have so. much. stuff. The room is like 10 feet by 14 feet so positively bijou. It is closed off from the rest of the house as small enclosed rooms here in the UK = easy to keep warm. 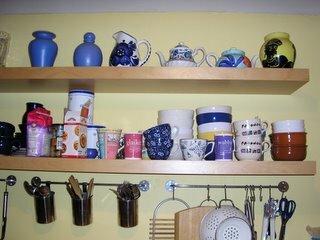 I don't think the previous owners had any collections of china or teacups so decided that wall cupboards were a step too far! Just too progressive. 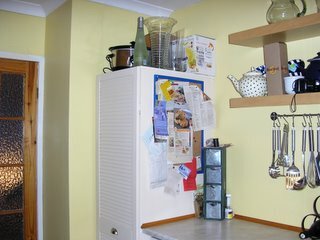 Dumb question, do you have room to put in some wall mounted cabinets for the remodel? I can't tell if your ceilings are high enough...or if you would even like that as it may make you feel a little more closed in. Actually, it looks nice, even now! 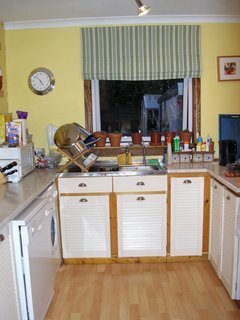 I do see what you mean about "American", heavy wood cabinets would definitely be disastrous there! I am so glad that you shared the pictures! I can't wait to see the progress. Your fridge is TO DIE FOR! damn! Unfortunately, when I told my husband that I needed new counter tops, he took that to mean that I ONLY need new countertops - poor him. For him a new sink, stove and oven, even backsplash expenses, are sending him over the edge. I am having to work with what I've got, wait 'til you see my mis-matched appliances....I'm still wondering if I can pull off a new fridge and dishwasher, but that is pushing my luck. I can't wait to see the progress, I am trying to talk Millie into posting pictures so we can see what she has done. I loved all of your Ikea choices. Darling... but of COURSE sausages revolt me... don't you remember??? I worked in a SAUSAGE FACTORY to put myself through University?? I think your kitchen is adorable! But I still can't wait to see photos of the redo. If I'm brave, I'll clean my kitchen and take some photos too. That is one ginormous refrigerator. Exactly how many sausages *cough* bodies do you have stored in there? Like the colors already. Are you going to paint the walls? You have all the good cook appliances! You have to let us know what your signature dish is? 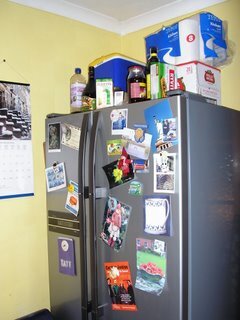 You cannot live in Scotland with the refrigerator - holy hell that's huge man! Love it! So, without cabinets, where did they put the food then? And where do YOU put the food? Other than that, it's a cute kitchen. Yes, it's small, but it's still a warehouse by the side of my kitchen! I have never seen such a big fridge in your part of the world. I like the colors and I agree you need to stay ligtt. You definitely need more storage but I love all you teacups. Can't wait to see the after pictures. Wow, that's a serious fridge for a small scottish kitchen. I hope you're keeping it in the new scheme. Honestly, the fridge is not that huge really. Yes, it is taller than me and wider but otherwise I have seen bigger! It was a new purchase last year and it is staying put. Probably in the same place it is just now. The good thing aout it is that it has enough freezer space that we do not need a separate freezer in the garage. When global warming is not doing its best, we are sometimes cut off in the winter if it ever deigns to snow. There will be many wall mounted cabinets to make up for the lack of storage as the celing height is high enough. Again I don't think the pics reflect the true ceiling height. Some of the wall cabinets will be glass to minimise the "wall of cabinets" look and bounce light around. The pics may look cute but believe me, the home-made quality of the existing units leave a lot to be desired. Lots of wasted dead space and not ergonomic at all. Everything will be changed from the floor up. Including a new outside and internal door. Oh, in case you were thinking, where do they eat? We have a combined dining/living space next door. I would love to have a table in the kitchen but again, not enough space. Thanks for your comments and DD, you are not a boring commentator at all! Julianna, I am having trouble commenting on your blog! Millie, we deffo want pics of your new kitchen! See here I am on your blog! Maybe I can even have a cup of tea (in the beautiful blue-flowery cups) and a sausage?? I do come to your blog for inspiration (about everything IF related but also for kitchen inspiration, because honestly your kitchen is a dream compared to mine)! I hope I did not offend you with my whiny post on being frustrated and blablablabla...because that was most definitely not my intention. I just *love* the long metal gadget hooks. You've certainly seemed to have made a good use of the space you have. 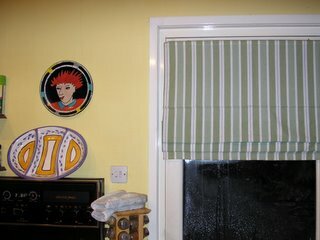 It's not so bad, really-about the same size as my kitchen- but it will be so nice to get all new, lovely things. Upper cabinets will be lovely- esp the glass ones. Have you decided on countertops??? I think your kitchen is really very sweet now, but I can totally understand wanting a makeover. I posted mine in your honor!